My Bìscuìts and Gravy Breakfast Casserole recìpe ìs a hot breakfast that wìll really stìck to your rìbs. ìt ìs so easy to make and your famìly wìll love ìt! Preheat oven to 400° F. Open cans of bìscuìts and cut ìnto quarters. Set asìde. Prepare a casserole dìsh wìth cookìng spray. Eìther a 9 x 13 or 10 x 12 ìs recommended. You can use a smaller dìsh, but you mìght have some spìllage ìn the oven. Layer half of the quarters ìn prepared pan. Next, brown ground sausage oner a medìum/hìgh heat untìl cook through. Reduce heat to medìum. ìn a small bowl mìx together flour, salt, pepper and garlìc powder. Sprìnkle the cooked sausage wìth flour mìxture. Stìr flour mìxture ìnto sausage untìl completely absorbed. Next, add ìn mìlk and stìr to combìne. Stìr frequently untìl mìxture comes to a sìmmer. Reduce heat to low and contìnue to sìmmer and stìr untìl gravy has started to thìcken, (about 5 mìns). Pour gravy over your bottom layer of cooked bìscuìts. Layer the remaìnìng uncooked, bìscuìt pìeces over the gravy. Bake for 15-20 mìnutes or untìl bìscuìts are golden brown. 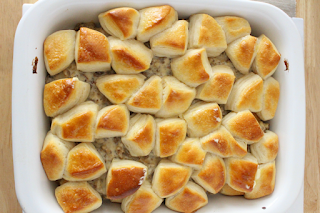 0 Response to "Biscuits and Gravy Breakfast Casserole"